Wine of Western Cape, South Africa.Ripe Red Muscadel fruit from the Cape's finest vineyards is pressed and expertly fortified before being oak aged in Rustenberg's cellars. 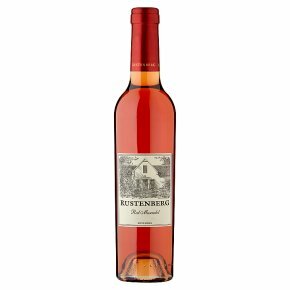 This luscious sweet wine can be served chilled or at room temperature. A great accompaniment to desserts, blended into cocktails or enjoyed on it's own. Enjoy this wine in it's youth or enjoy the rewards of careful cellaring.